When she was a child, Sister Hellen suffered the consequences of conflict in northern Uganda and lived as a refugee throughout her childhood. Today she prepares thousands of refugees to start their lives over in Kampala, Uganda by teaching them English. I was seven-years-old when war erupted in northern Uganda. 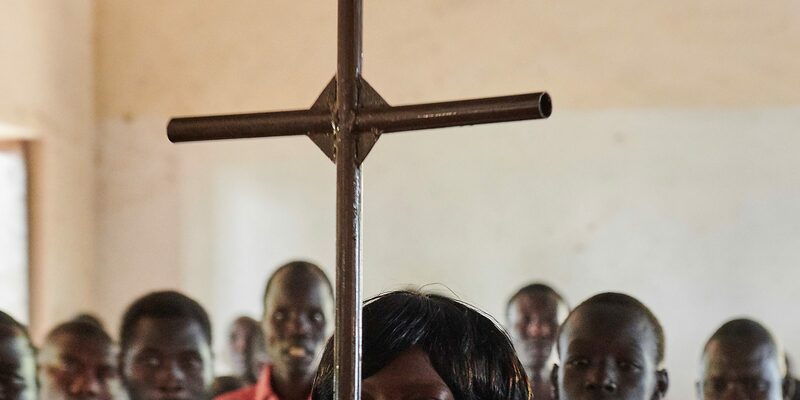 One afternoon there were explosions and gunshots surrounding our home so we took off for hours and hours until we arrived at the Nile River on the other side of present-day South Sudan. We spent the night by the river and then walked for eight hours, climbing hills and valleys to reach Nimule, (then in Sudan, now in South Sudan). A week later we were packed like sacks in a big lorry and taken to a camp where there was practically nothing. We used to walk for hours and hours to get water every day use. Thank God there were at least tents for children to sleep in. I stayed there with my family and my mother had to work like a man to build our home where we lived for four years. Now and then children died from malnourishment and illness. We didn’t go to school for many months until one day we started to have classes under a tree. We learned like that for three years. At school we enjoyed, but at home life was very difficult. We would work in exchange for food and we’d only eat once per day or every day. My experience helped me to be the most serious student in class when I returned to Uganda. Today, I teach English to thousands of refugees, because I know that the most important thing in life is to learn and to communicate. When you are unable to communicate you lose all opportunities. Urban refugees have many difficulties. They have to pay their own rent and find their own sources of income. We know that those who cannot find jobs have no way of sending their children to school. There are too many children still left at home and not able to read or write in this modern age! However, if parents can manage to learn English, many of them can succeed with their own initiatives. When I go to downtown Kampala I meet many of my students selling goods and working in businesses. They are supporting their families and do not need to come back and ask us for food and rent money. It fills me with so much joy to see them speaking English and to know that some of them are sending their children to school. For example, one lady named Cibalama E. studied English in my class. She was such a determined lady and after perfecting her English she joined the Jesuit Refugee Service hair dressing class. Then she joined the JRS business class. Eventually she started her own business and today she takes care of her family and sends her children to school on her own. This work is very important because it makes people feel they are valuable. When you are displaced you feel the entire world has become blind to you. If people are leaving their countries it is because they have no other alternative. People need to remember that if refugees can go back home, they gladly would. When children attend school, the future of the entire family becomes brighter. In school, children become responsible because their minds and hearts become more open and they learn how to practically use their skills. JRS in Kampala assists a few young children to attend primary school and some of these students excel and find scholarships to join secondary school and then university. There was one child we took to primary school and in two years he emerged to be the best student in the class with distinctions. The Jesuits adopted him and took him to a boarding school in Gulu. Today he is the best student in the class. While they’re displaced, though, refugees need understanding, care, and love. They need to be listened to and supported as they try to adapt to a new culture and society. Refugees must also remember that this is not the end of the world. They must begin anew and adapt to their new environment. I wish people in the host communities would also try to learn about the culture of refugees in their neighborhoods. Governments should give refugees the opportunity to study and live freely. In Uganda, refugees can live peacefully, but they still need more support to go to school. Ultimately, we must end war. If I had money and power and strength, I would go all over the world to advocate against war and preach peace. War does not reward. All people deserve to live in peace in this world. Sister Hellen is a member of the Evangelizing Sisters of Mary and is the Education Coordinator for JRS Kampala. She has worked with refugees in the city for six years.